We Scare Hunger is at John’s ValuMart today! Northern Lights Ford is ramping up our efforts for the final 2 weeks of our We Scare Hunger Campaign and will be at John’s Valu-mart this Saturday, October 20 from 11:00 to 2:00, and next Saturday, October 27 from 11:00 to 2:00 where you can make a donation of any non-perishable food item or a monetary donation. Let’s stop hunger in its tracks! 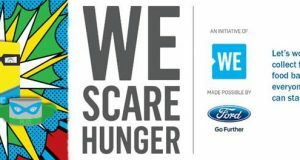 The We Scare Hunger Campaign is in it’s 4th year which is an initiative of WE and made possible by Ford of Canada.